18 October/November 2018 unmanned systems inside USER SHOWCASE Photos courtesy of Microdrones. 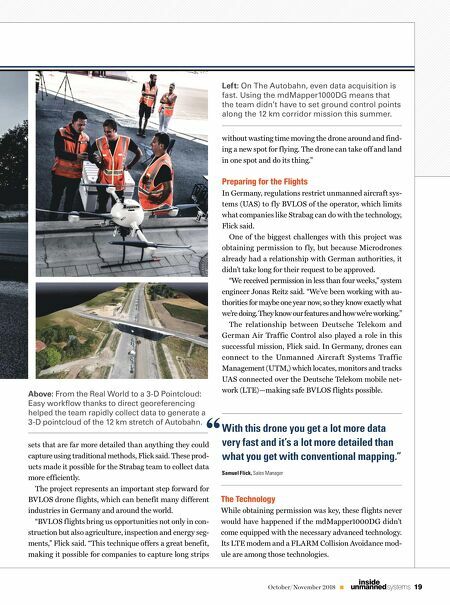 I n June, the mdMapper1000DG from Microdrones successfully mapped 12 kilometers of corridor along highway A33 for German construction company Strabag—and f lew beyond visual line of sight (BVLOS) in uncontrolled airspace to do it. These groundbreaking f lights, one 5 kilometers and the other 7 kilometers, represent a milestone for the drone in- dustry, Microdrones sales manager Samuel Flick said. Not only was Microdrones able to meet German requirements to receive approval for the BVLOS mission, the team de- ployed a system equipped with advanced technology that enabled them to quickly, easily and safely complete the f lights, saving the construction giant a significant amount of time and money. With these f lights, Microdrones provided Strabag with a point cloud and orthomosiac of the highway system, as- The manufacturer was able to meet Germany's requirements for conducting BVLOS ights in uncontrolled airspace, a milestone for the drone industry. by Renee Knight FIELD TESTED, FIELD PROVEN. 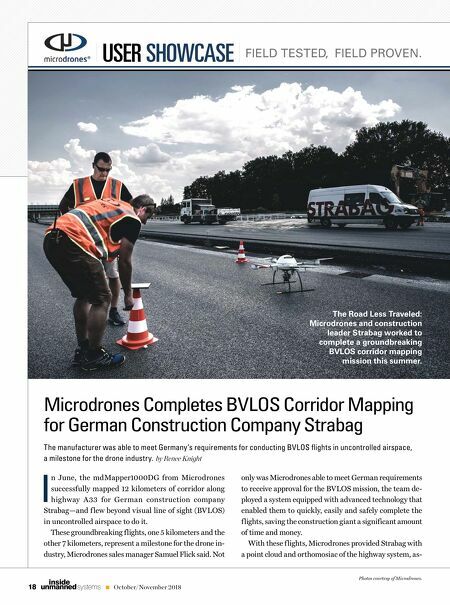 Microdrones Completes BVLOS Corridor Mapping for German Construction Company Strabag The Road Less Traveled: Microdrones and construction leader Strabag worked to complete a groundbreaking BVLOS corridor mapping mission this summer.